Good chisels never die, they just turn into paint can openers. But concealed under that dull and dirty exterior could be your best chisel of all. In fact, when sharpened correctly, it probably will be. Chisels sold before WWII were made for a world where people actually earned their living with hand tools. A good chisel cost a day’s wages back then, and woodworkers expected their money’s worth. Today, these forgotten gems are practically free. All it takes to bring an old chisel edge back into fighting trim is a little faith and four easy steps. The job takes less than 30 minutes if you follow my advice. 1) Start removing any old gunk on the blade and handle. WD-40 and a rag might do it. Hardened blobs of paint or varnish are best zapped with some citrus stripper. Do you have a few old chisels to choose from? Start with just one, the chisel with the least surface rust. The job of turning this artifact into a serious performer boils down to creating two smooth, converging surfaces that come together at about a 25º point. The less pitting and surface defects you have to correct along the way the better. 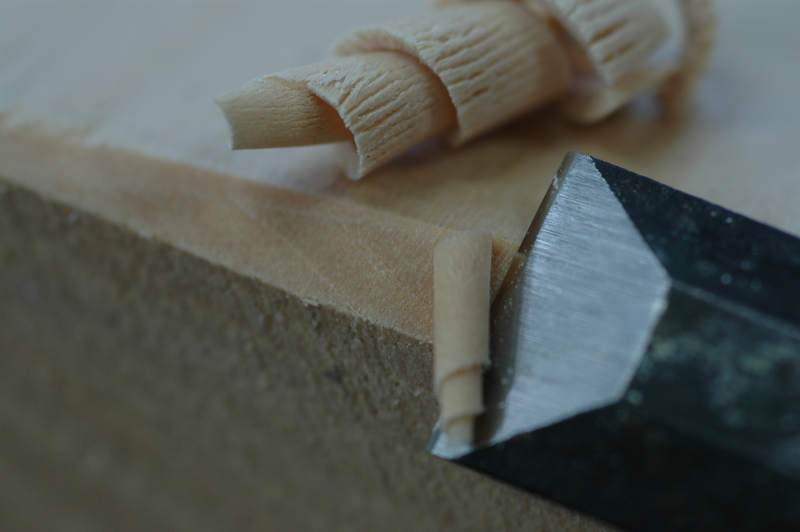 2) Next, turn your attention to the back face of the chisel – the one without the beveled edge. 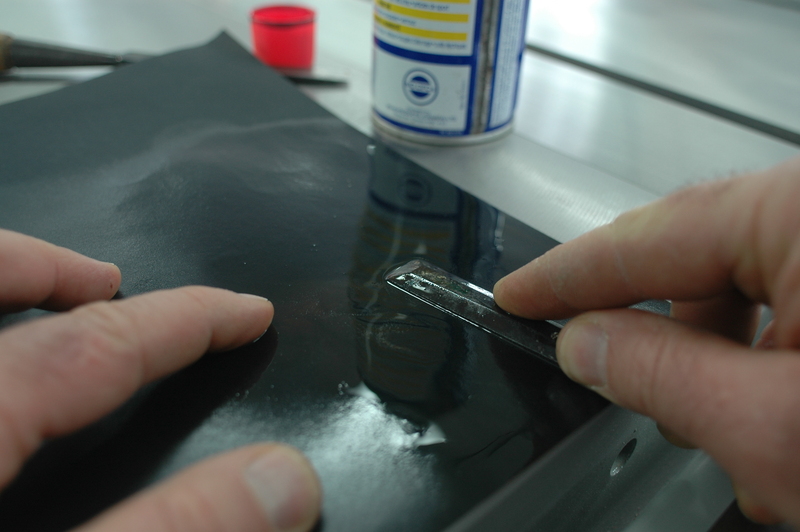 You need to make the last inch or two perfectly flat, smooth and shiny. And how you begin depends on the chisel you’re starting with. If the metal looks pretty good, then ten minutes of rubbing on a piece of 180-, 220- then 400-grit wet/dry sandpapers sitting on a piece of plate glass or a cast iron tablesaw top does the trick. Use some WD-40 as a lubricant. But if you’ve got pitting or damage to work through, hand lapping becomes impractical. You’ll need machine power. 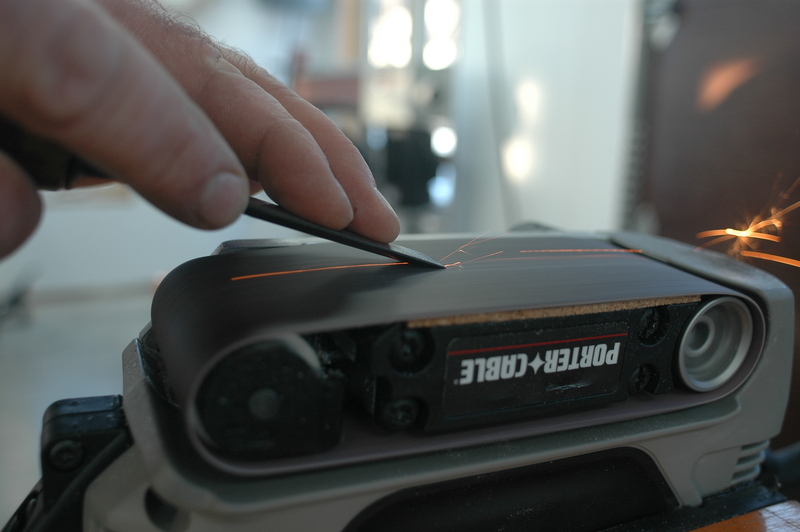 A belt sander clamped upside down in a portable workstation and spinning a 120- or 180-grit abrasive does a great job. Just take precautions. There’ll be a few sparks (not many), so do the work outside while wearing safety glasses. You’ll also need to remove any dust bag and vacuum off existing sawdust from the sander before you begin. As you refine the back face of the chisel, make sure it turns out flat and smooth, all the way along the last 2” of the tip. Also, don’t let the metal get too hot to hold. Any hotter and it could make the steel too soft to retain an edge. Cool the tip in water every 10 or 15 seconds of grinding. 3) Now it’s time to work on the bevel. Chances are that it’s damaged, with rounded corners and too steep a shape. You could refine the bevel on the belt sander, or a bench grinder. Either way, you need to create two things: a 25º angle with the other face of the chisel, and 90º corners. Once again, watch for heat build up, especially if you’re using a bench grinder. 4) Time to refine. Your chisel will look pretty good by now. It also remains useless for woodworking. That’s because the edge is still hopelessly crude. You need to refine it to razor sharpness. This is honing and here you have a choice. Traditional honing involves rubbing both faces of the chisel against progressively finer sharpening stones until the edge shines like a mirror. This method works well and I used it for years, until I found something that yields sharper results much more quickly. See “Two Minutes to a Razor’s Edge” tip below for details. Chisels are like puppies. They’re both what you make of them. Learn to draw the full potential out of vintage chisels and they’ll show you that an old dog can certainly learn to do new tricks again. 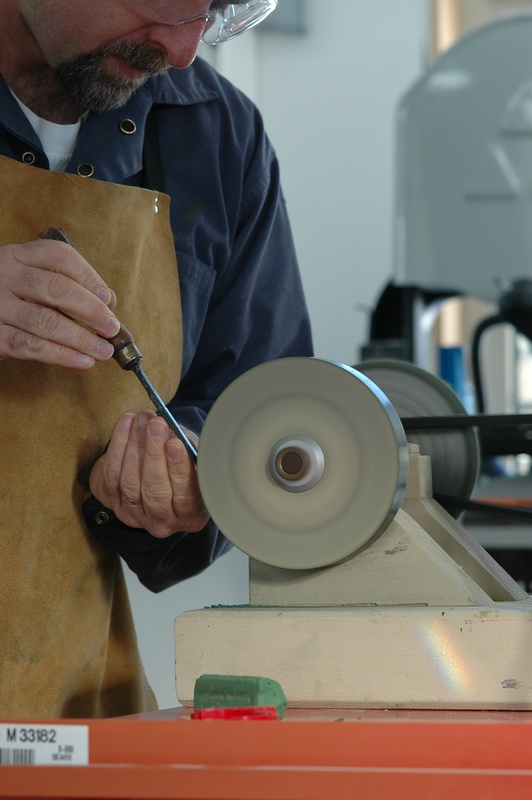 When it comes time to hone my chisels after grinding, I move right from the bench grinder or sander to a hard felt buffing wheel charged with an abrasive compound. Mine spins at 3500 rpm on a bench-style grinder, but slower works, too. Start by buffing the back face of the chisel so it shines. Two things are crucial here: The chisel must remain tangent to the wheel at all times, and the chisel tip must point in the same direction as wheel rotation. Be especially careful not to dub over the edge as you work. It must remain flat and straight, right out to the tip. One minute is all it should take to yield a mirror shine. Next, flip the chisel over and buff the bevel in the same way. Results are fast and more than sharp enough to take hair off your arm. Buff again at the first sign of dullness and you’ll re-establish an ultra-sharp edge in about a minute.